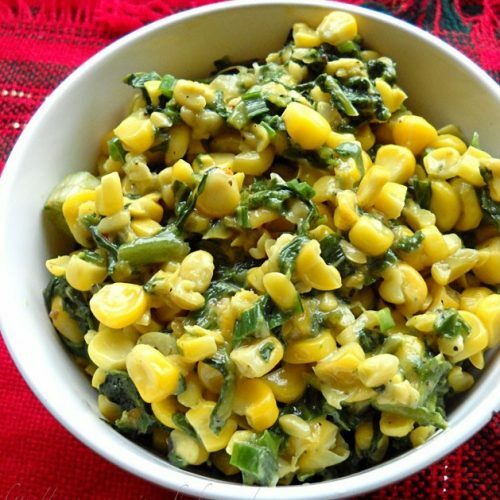 sweet corn spinach recipe - easy to prepare cheesy corn spinach recipe. boil the corn cobs in water for 15 to 20 mins. when they warm or when they cool down, remove the kernels from the cob with a knife. keep aside. rinse the spinach in water thoroughly. chop them and keep aside. chop the scallions and garlic. reserve the greens for garnishing. now add the scallions and garlic to it. saute for 2 mins and then add the chopped spinach. the spinach would have softened and considerably cooked after 3-4 mins. now add the boiled corn kernels. mix the corn with the spinach and spices. saute for 2-3 minutes more. check the salt and seasonings and add more if required. serve corn spinach hot with warm or toasted bread.